Challenger Lifts’ 14,000 lb. capacity 4P14EFX and 4P14XFX economy four post car lifts are loaded with features you would expect to pay more for, like louvered approach ramps, solid piece column construction, automatic wheel stops and the highest rise in the industry. With optional rolling jacks, oil drain pan, etc., you’ll be able to accommodate just about anything that comes in for service and afford room to grow with its reasonable cost. 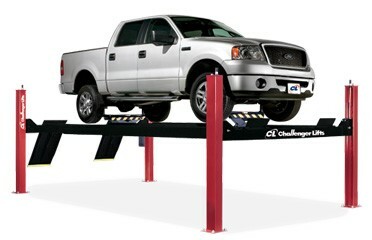 Turn your 4P14 general service four post car lift automotive lift into a wheel alignment capable alignment rack. Our optional bolt-on alignment kit with stainless steel turning radius gauges Part #40200-3DSS is 3D alignment capable, offering an economy option to perform fast and profitable wheel alignment work. With optional rolling jacks, oil drain pan, etc., you’ll be able to accommodate just about anything that comes in for service and afford room to grow with its reasonable cost. Turn your 4P14 general service four post car lift automotive lift into a wheel alignment capable alignment rack. Our optional bolt-on alignment kit with stainless steel turning radius gauges Part #40200-3DSS is 3D alignment capable, offering an economy option to perform fast and profitable wheel alignment work.